First of all, I just want to get across my extreme disappointment with this cover. By far, its the worst DC cover I’ve seen to date. Batman and Lex Luthor are doing a tango and they’ve got their legs in a love-scissor that looks horrible and extremely awkward. What was Finch thinking when he drew this? Or whoever wrote the brief for this cover? And not to mention, this is an extremely misleading cover since the events portrayed here-in don’t actually happen. And this is something that Forever Evil #4 shares with Justice League #26. 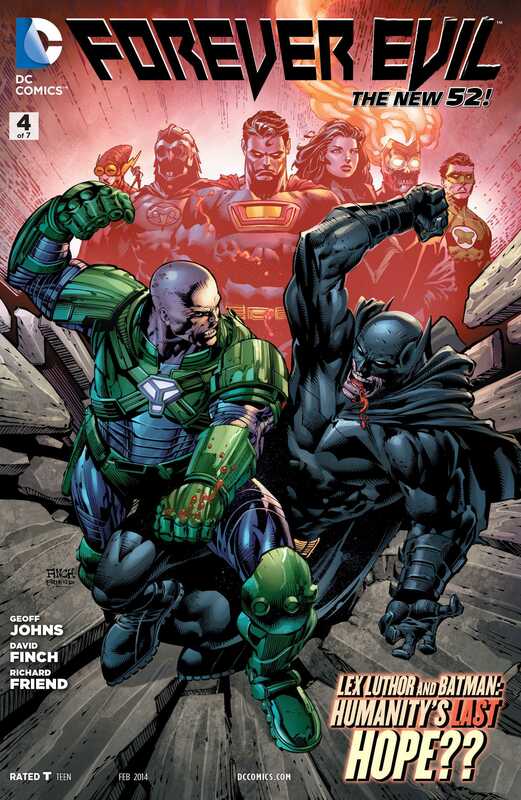 I’ve griped before about the covers for Forever Evil and this is just more ammunition for my argument. Anyway, on to the story. We start off with a sequence that involves Batman taking Selina to the Batcave. It promises a lot of character drama particularly since as far as the New 52 is concerned, this is Selina’s first trip to Batman’s big bunker-base and she’s suitably awed. But the thing is that all Geoff Johns does here is give the reader a tour of the place. We don’t actually do anything, or rather, don’t actually see anything get done. Batman’s box of tricks to neutralize the Justice League members makes a return in this issue and we finally see just what he’s gathered to take down his friends should they ever go rogue. Or in this case, the Crime Syndicate. The one big gaping plot hole is what he has that can counter Owlman, who is his Earth 3 doppelganger? We don’t learn that. Its a nice enough sequence and all, but I was disappointed that it didn’t fulfill its promise. Then we have the Injustice League, informal at best, and we see a pretty much every day story there as they all recover and plan their next move. Johns write Captain Cold and Lex Luthor really well in these pages, and we get a lot of hints as to the subtle conflicts between these villains. I particularly liked Captain Cold here, and I would love to see him take on a more important role in the group. Black Adam is still recuperating from the heavy beating that Ultraman gave him a while back and he doesn’t do much in this issue, but the fun is all in seeing him back again. And later on, we get some nice insight into Luthor’s character, even though some of it feels forced and slows down the pace of the issue a little too much. And finally we have Power Ring himself, an insecure and cowardly member of the Crime Syndicate who is sent to take care of the Rogues. There’s some nice characterisation of this evil version of Hal Jordan, and its definitely one of the few good things about this issue. Ever since his New 52 debut in Justice League #23, he is one member of the Crime Syndicate that I really like and its nice to see that he’s getting a lot of things to do as the series goes on. In the final pages of this issue, we get this nice big action sequence that ends up being a disappointment. The clash between Batman and Power Ring is over far, far too quickly and just ends up being the setup for another fight in the next issue. Geoff Johns has done some crazy awesome events in the last few years, but with Forever Evil he seems to have lost his magic touch and I just can’t get all that excited about this title any more because it seems to be stuck in a bit of a rut. David Finch’s artwork once again proves to be quite disappointing. The primary issue with his work is that his characters are all over the place and there’s little to no consistency in how they are drawn. Characters like Ultraman suffer the worst from this while Selina Kyle and Batman and Power Ring almost get away from that. Finch’s pencils just don’t work for me because his characters’ body proportions always seem to be off one way or another and while he does some nice splash pages, overall his art suffers from there being way too many details. Richard Friend’s inks seemed to be on the heavy side for this issue, but they are not all that bad, and the same could be said for Sonia Oback’s colours as well. A little too much shine and gloss here and there, particularly where Selina is concerned, but other than that, pretty good work for the two of them. Overall, I’ve very, very disappointed with this issue. Right now I can’t help but wonder if it would have been better for DC to double-ship this title. That would have helped with the event pacing certainly. And one more thing. For being the evil Justice League, the Crime Syndicate isn’t doing a whole lot of evilling. They all seem to just be caught in their own infighting and their own needs rather than actually exerting their control over the world and making life hell for civilians populations everywhere. This is not the Crime Syndicate, this is Evil Supervillain Team Generic. More Forever Evil: #1, #2, #3. Posted on December 26, 2013, in Comics Reviews, Review Central and tagged Batman, Bizarro, Black Adam, Black Manta, Captain Cold, Catwoman, Comics, Comics Review, Crime Syndicate of America, David Finch, DC Comics, DC Universe, Event Comics, Forever Evil, Geoff Johns, Grid, Injustice League, Lex Luthor, New 52, Power Ring, Review, Review Central, Richard Friend, Science Fiction, Sonia Oback, Superheroes, Supervillains, The Rogues, Trinity War. Bookmark the permalink. 6 Comments.